Fintech valuation Part 2. This is a continuation from our last article How to Sustain Fintech Growth by avoiding “Gravity Drag” . In that article, we explored the Fintech growth trajectory using some real world examples. Using a simple model we concluded that this market started off with a “hype”, with off the scale valuations. After reaching a peak, the market significantly corrects, swinging the pendulum to the other end, and then over time, it reaches a sensible equilibrium point. I also proposed that those firms that build a solid foundation can dampen the effect of “gravity drag”. In this article, I explore various 10 ways in which the value of a Fintech firm can be significantly enhanced, by focusing on top line and bottom line levers. After a really HOT 2015 for Fintech valuation, the market may be cooling off slightly as we pointed out in our previous article. Apart from Fintech valuation compression, as highlighted by Sammantics, venture capitalists are also taking a more cautious approach to investing in this sector. According to Business Insider (citing a joint report by KPMG and CB Insights), after a 106% rise of investments in Fintech in 2015, it appears that the “we’ve passed a peak”, as investor take a more cautious approach. Despite caution however, the report affirm that interest in Fintech will continue. In 2016 and beyond, the market will turn in favour of investors and Fintech firms will find it harder to secure funding and eye watering valuations achieved by some of the unicorns. (fro example Funding Circle at 48x top line revenue) had achieved. Investors will be less jaded by the hype and adopt a more rationale approaching to investing in Fintech. As Huy Nguyen pointed out in his blog, “Back to basics”, “Profitable Growth” and “Quickly Generate Cash” will be the key words for 2016 and beyond. So lets tale a closer look at strategies Fintech Firms can use to significantly enhance valuation and avoid the downward pressure (or “gravity drag”) that investors will exert because they are more attuned to the risks. Fintech founder(s) looking for accelerated growth: Valuation is crucial for initial and subsequent fund raising, as you don’t want to give away a large chunk of your company away, especially to early stage private investors. Fintech founder(s) looking to exit: Whether the Fintech founders are looking to exit through an IPO, trade sale, or merger & acquisition, valuation is crucial as it will determine the exit price and any earn out terms. Strategic Acquirer: They are motivated differently to financial acquirers (such as a private equity firm). These firms look for synergistic value that the Fintech can bring to their business and help them grow. They will generally value a company differently to a financial acquirer. A typical example would be a large bank buying out a RegTech firm for example, to help them deliver regulatory compliance in a faster, more efficient, more accurate and cheaper way. Again in such a case, beside the valuation, the deal may be structured totally differently, perhaps requiring more onerous earn out agreement. There are divergent needs between what the investors want and what the Fintech founders and shareholders want. Whilst investors will want to reduce valuation because of perceived risks, the entrepreneur will aim for higher valuations, selling the up side attainable by the investor or acquirer. Valuing a Fintech firms is more art than science. Valuations were driven largely by supply and demand and the frenzy by investors to invest in the next Air BnB or Uber of financial services. Many traditional valuation methods (such as discounted cash flow analysis) don’t always work because of the lack of data. For Fintech firms, the Revenue has traditionally been the top line or gross revenue, because many firm are not at the stage of delivering positive net profits (or EBITDA (Earnings Before Interest Tax Depreciation and Amortisation). Going forward, investors will however demand profitability and healthy cash flows. Stable, recurring and predictable revenue streams is what investors and acquirers are looking for. Simply, valuation can be enhanced by either increasing revenue, or the multiple or both simultaneously. Now you may think that the Multiple is dictated by the market. Read on and find out how you can influence the mulatiple. Increasing revenue can be a challenging and longer process. The Multiple on the other hand can be a lever that quickly drives up valuation or conversely, quickly drive down valuation if not managed properly. Valuation can be enhanced by either driving the multiple up or preventing investors from finding reasons to drop the multiple. We explore 5 factors in each category that will help you enhance the valuation of your Fintech venture. Culture, Capability & Talent: Venture capitalists invest in the team and not necessarily the idea. They invest in the team being able to execute the strategy to deliver exceptional growth. The right culture attracts the right type of talent. This creates the firm’s overall capability for rapid and sustainable execution. Fintech is unleashing a war on tech talent and being able to attract and retain top talent gives investors or acquirers confidence of sustainable growth. Intellectual Property & Innovative Systems: In the absence of revenue or a customer base, intellectual property adds value to the firm. So don’t overlook any patent protection, trademark or design registration. Innovative systems also gives the firm the the ability to do things better, faster, and cheaper compared to traditional financial services firms. Systems must be well documented and repeatable, allowing for rapid expansions into new geographies and markets, independently from the founders’ involvement. Acquirers will also want comfort that they can continue to operate the business after your exit as founders. Expand Products, Services & Geographies: Product based businesses seem to win greater favour from investors compared with service based businesses. Even if you deliver a service, package that service into a product with recurring revenues (as far as is possible), such as a subscription model. A “one trick pony” is a risky proposition for investor. So once you gain traction with one product, branch out into others. For example a market place lender can branch out from personal lending to business lending or into offering security like debt investments through crowdfunding. With the right teams and the right systems, you should be able to quickly scale up to launch new products. Scalable Distribution Capability: If you have achieved all of the above, then you will start to get noticed in the market and you will attract bigger players who will want to tie up with you. For example, the UK Government owned British Business Bank, used Funding Circle’s to extend around £60million of finance to SMEs. This gave Funding Circle a huge boost. Their market dominance led them to successfully agree an SME loan referral arrangement with Santander. Without the first 3 in place and some significant market traction, getting to stage 4 will prove hugely challenging. Brand Presence and Scale: With a few larger distribution agreements in place, the Fintech firms start to gain market attention. Their brand is widely recognised and allows them to scale up quickly for high growth in several markets. At this stage, Fintech firms invest in building their brands – however not at the expense of cashflow or profitability. These firms now go on to become unicorns and attract significant multiples in access of 30x. At each stage of the growth cycle, Fintech firms are subject to gravity drag. Inevitably, like all start-ups, things can go wrong along the way and many fall by the way side. Venture capital firms expect 9 out of 10 firms to go belly up, and their hopes are usually pinned on the one firm that will go on to become a unicorn. Investing or acquiring a firm is a risky business. The Investor or acquirer is buying the ability of the Fintech firm to continue generating strong and sustainable revenue into the furture. Investor discount valuation when they perceive that these future cash flows are at risk. Here are some strategies to help you defend investors wanting to decrease valuation multiplier. Resilient Systems, Processes and Controls: In the early days, a high growth firm is like a Ferrari engine in a 1970 VW body. The founders have high energy, great ideas and ambition, like a Ferrari engine, but they lack the robust infrastructure of the Ferrari chassis. At low speeds the creeky and often pieced together infrastructure work. However as growth rates accelerate, weak or a lack of systems and controls often result in operational failures or worse – business failure. For example, bugs in the IT systems amplify as flow volumes increase, or the finances go out of control because of poor financial record keeping or inability to collect invoices quickly enough. Investors will scrutinise the ability of firm’s to manage cash flow, costs, and maintain revenue growth whilst also building the assets on the balance sheet. Ability to Protect Reputation & Manage Risks: In AON’s 2015 risk survey, reputational risk was highlighted as the no. #1 risk by 1,481 executives from 28 different industries. Reputation encompass many things, including how firms treat customers, honesty and integrity, quality of products and services, quality of customer service, conduct of senior management, and corporate social responsibility. Operating in a digital world and driven by social media, Fintech firms are particularly susceptible to reputational damage. These firms also expose themselves and their customers to financial risks. Remaining unchecked, these risks could significant hurt future cash generation, because customer leave en mass or firms have to pay out redress cost for failing to protect them . During their due diligence process, investors will closely examine the firms’ ability to anticipate and manage such risks. Effective risk management systems that prevent risks from materialising, will be more highly valued, and absence of such systems will result in a reduction in revenue multiplier. Ability to deal with Regulatory Change: Fintech firms operate in one of the most highly regulated industries in the world. They have evolved in a “light touch” regulatory environment, allowing this sector to flourish. Meteoric growth rates have caught regulators’ attention and undoubtedly, regulation will tighten to protect consumers. Firms subject to regulation can’t start trading without a regulatory license. Straying off the regulatory path, even inadvertently, can result in the Fintech venture being shut down by the regulator. Being able to quickly respond to regulatory change will put the firm in a favourable position. Having 1 and 2 (above) in place will enable an organisation to quickly and effortlessly implement any kind of change, let alone regulatory change. Market leaders will not only be able to comply, but use regulatory compliance capability as a competitive advantage. Strong Leadership Team & Succession Planning: Once you have the fundamentals in place as highlighted in 1 to 3 above, the business will continue to deliver consistent and sustainable revenue. A good leadership team will then continually strive to explore and effectively exploit super growth opportunities. A leadership team that is lacking certain core skills or is not a cohesive team working towards achieving the firm’s aggressive high growth goals, will start to leak value. Dependence of certain key individuals is another significant leadership risks, so is the lack of a well defined and executed succession plan. Investors will expect continued high growth rates and they will want evidence that the next layer of management is already being developed to continue the growth trajectory. Ability to Brace Environmental Headwinds: 1 to 4 is within your control, however to maintain steady growth rates, the firm must be able to control adverse environmental scenarios that expose it, to sometimes uncontrollable risks. For example, how will the firm cope through a recession? Will a bad actor tarnish the reputation of the entire industry. Having a well run business with diversified product, channel and geographic strategy will help to dampen some external scenarios. A proactively stress and scenario analysis will also help leadership teams anticipate and proactively position the firm to manage such headwinds. Fintech valuation is certainly coming under pressure, as the hype is knocked out of the market. In addition to building sustainable profitability (not just top line revenue), you can significantly enhance valuation multiples by following the recipe set out above. Similarly, you now are equipped with robust strategies to defend downward pressure that investors and acquirers will exert on the valuation. By correctly executing the above formula, you will be well placed to become the next unicorn. 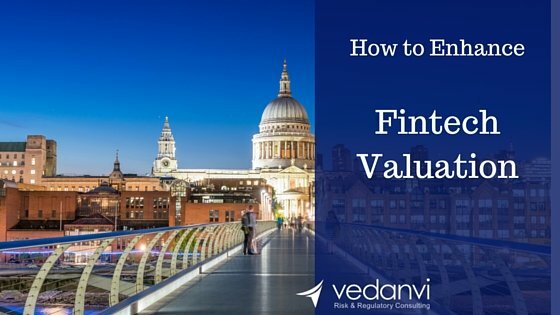 For more information or to discuss how you can enhance your Fintech firm valuation, get in touch by contacting us, or calling +44 203 102 6750 or email enquiries@vedanvi.com. Can you help with valuation of a start up fintech that has a unique digital advisory model? We can put you in touch with our partner firms who specialise in valuations.